In partnership with Velocity Dance Center, American Dance Abroad and Artist Trust. 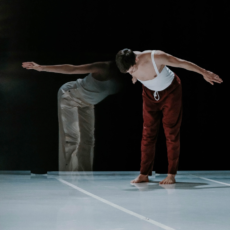 Inspired by the Pacific Northwest Platform presented each Winter in NYC by Velocity + OtB, American Dance Abroad hosts American Dance Recon on June 11 at Velocity, an intensive symposium that brings international programmers to U.S. cities with a strong and vibrant dance scene. Programmers engage with the local community through attendance at performances, visits to company rehearsals, focus groups and discussions, and conversations with local dance leaders. American Dance Recon/Global provides opportunities for international programmers to see American dance that is already touring in their part of the world. This effort encourages increased interest in available American artists and further nurtures relationships among artists and programmers. The events in Seattle are part of the 2018 American Dance Recon held in Los Angeles, Portland, and Seattle. Happy Hour Gathering with presenters at 10 Degrees, hosted by Artist Trust. A group of international dance programmers will discuss their curatorial practice, their views on American dance and their experience visiting the West Coast, in a discussion moderated by American Dance Abroad. Seattle is the second stop on the programmers’ tour of Los Angeles, Seattle and Portland for American Dance Recon, a program designed to immerse them in strong and vibrant dance communities in U.S. cities. The audience will have the opportunity to pose questions to the visiting programmers and to mingle with them over drinks and hors d’oeuvres. All are welcomed, though this opportunity will be especially valuable for choreographers and other dance professionals who are interested in working internationally! Registration is not required. We extend a special thanks to the Andrew W. Mellon Foundation for its support of American Dance Recon and to Artist Trust for their sponsorship of this event! zoe | juniper Seattle-based dance and visual arts team co-founded by choreographer Zoe Scofield and visual artist Juniper Shuey in 2005. zj dissolves barriers between art, artist, and audience by challenging expectations of perception. They employ a specific, singular combination of bodies, light, sound, and sculpture to realize each project. Our new work is comprised of three discrete parts to be presented together or separately. Part 1: audience lays on the floor; part 2: audience is seated around the dancers; part 3: a 360 degree film. 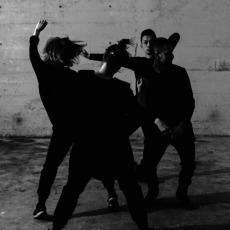 Collaborators include: company dancers, Juniper Shuey (video projection), Julian Martlew (sound), Thomas Dunn (lighting), and Bebe Miller (choreographic mentor). I am utilizing a simple shift in the structure of traditional performance to alter the audience-dancer relationship. In addition to playing with the space between the floor and the ceiling, we are working on projections for the ceiling and walls. I am curious how this orientation change can allow us to experience being a dancer and an audience member again, as if for the first time. With this simple repositioning, what vulnerabilities come into play for all of us? 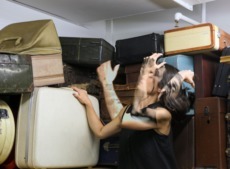 Alice Gosti is an Italian-American choreographer, performer, teacher, curator, dj, and architect of experiences, working between Seattle and Europe since 2008. She believes in three things: the ineffability of art, the cultivation of caring, and autonomy. Alice belongs to a legacy of process-focused experimental art that constantly finds its inspiration in current and historic social realities. “Unruly yet rigorous, feminine yet rebellious, task-like yet mischievous.” —Dance Magazine. Material Deviance in Contemporary American Culture (MDICAC) is an immersive installation, dance performance, and communal ritual. It takes a sideways look at our object-based reality. Refracting stuff-centered culture back to ourselves, this dream state passes through shame, nostalgia, patriotism, and the weight of inheritance. Do the objects imbued with so much of our worth start to take over and take on a life of their own? This cluttered landscape expands like a hoarder’s collection and contracts like an immigrant’s suitcase. It breathes like capitalism, filling an existential void whose appetite is endless. We uncover what is buried under the piles. We hold it in our hands. Dani Tirrell Dance artist, performer, choreographer, advocate, space healer/holder, and dance educator. Currently Dani’s work focuses on queer, gender non-conforming, and black healing practices. Dani also incorporates House, Vogue, Whacking and African Diasporic movement in his artistic practice and work. Black Bois cry, laugh, feel, love and want to be loved. Black Bois is a ceremony to our ancestors, to our bodies, and to our minds. It is a healing space, a space to process, a space to love, a space to create and be. It is the story of our fathers, brothers, lovers, and friends. Kim Lusk Fast-rising Seattle choreographer Kim Lusk delivers cheeky, rigorous, and enlivening dances to delighted audiences. She is descended from a hearty line of Montana cowboys and her work is fueled by their strong-willed and spirited nature. Kim also performs with zoe|juniper and Peggy Piacenza. Mark Haim Choreographer for the past 35 years, Haim has created works for the Nederlands Dans Theater, Ballett Frankfurt, and companies around the world. He toured his full-evening solo, The Goldberg Variations, with pianist Andre Gribou, from 1997–2002. His full-evening work, This Land Is Your Land, toured to Paris, the American Dance Festival, and FOCUS Dance at the Joyce Theater. 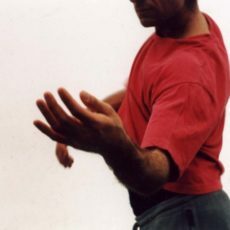 56-year-old Haim memorizes movements contributed by 432 people he has known—family, relatives, friends, lovers, colleagues, mentors, students, collaborators—from 20 countries and ages 4 to 90—and performs them in age order. A meditation on life and our inter-connectedness. Kate Wallich + The YC Prolific Seattle choreographer, Dance Magazine’s “25 to Watch” 2013, 2015 Rauschenberg Foundation AIR, and Velocity 2017 AIR. Wallich captures the savvy influences and talent of the post-internet generation. With her company The YC, she regularly sells out Seattle’s largest venues and leads packed classes with her captivating brand of movement technique including her popular community-focused class Dance Church™. Dream Dances is a meditative study in forming/re-forming and spatial geometry. Like the heightened reality of dreams, the work brings “amplified life” to the stage. Industrial Ballet is an evening-length dance and live music super-show inspired by the transgressive industrial music of the 80s and 90s. The YC is joined by a stellar group of Seattle musicians in this darkly glittering large-scale production. Pat Graney is a Seattle-based artist working in dance/installation. The PG Company has toured to most major American cities as well as abroad. Ms. Graney is the recipient of a Guggenheim award, a US Artist Award, an Alpert Award and the Arts Innovator Award. In 2013, Ms. Graney was awarded the Doris Duke Performing Artist Award. Ms.Graney began KTF/The Prison Project, which has been to over 20 prisons across America as well as abroad. Keeping the Faith works with incarcerated women through writing, dance and visual arts to help them discover a sense of self and how that self relates to community. Girl Gods received two ‘Bessie’ New York Dance & Performance Awards for Outstanding Production and Outstanding Visual Design. Jody Kuehner Part drag queen, part contemporary dance, and part performance art, Cherdonna Shinatra is a queer, femme, professionally trained, contemporary dancer who uses clowning, drag, theater, comedy, performance art, camp, pop culture, gay culture, dance traditions, feminist traditions, absurdity and subversive commentary to make art. Cherdonna is a persona created by Jody Kuehner to explore and question our world. one great, bright, brittle alltogetherness is a culminating dance and music spectacle concerning itself with ideas of gender, queerness, feminism, the body as a canvas for social change, and community as collective. Cherdonna creates a world where linear time and social standards do not exist. Multiple realities are happening at once. Explore the infantilization of the feminine. Embroil in the conundrum of being. Gape at the amazing circumstances within which we exist. Trace the ties from birth to death and back again with the help of drag queen Cherdonna, a chorus of adult toddlers, a seven-piece brass marching band, and a live feminist painting. American Dance Abroad is a national organization that seeks equitable cultural engagement among American dance artists and companies and their international counterparts. It facilitates introductions and creates opportunities for artistic discovery and dialogue. It was created as a tactical response to the decline of American dance in the global marketplace as put forth in Dance America: An International Strategy for American Dance, co-authored by Carolelinda Dickey and Andrea Snyder in 2009. Acknowledging that international dance currently has a broad presence in the United States, American Dance Abroad’s primary mandate is to expand international visibility for American dance, fostering parity by increasing opportunities for individual artists and companies. We help artists and companies enter and navigate the global marketplace where they can build their own, long-term, mutually beneficial relationships. American Dance Abroad promotes American dance at global marketplaces, festivals and international gatherings. American Dance Abroad provides support and resources that help dance professionals establish and strengthen relationships with foreign colleagues. American Dance Abroad provides support and resources that enable foreign colleagues to see American dance.